Gattung Frailea (Br. & R.) Prestlé 52 (1997), without latin descr. or type. On beautiful summer days one can admire the splendour of its beautiful yellow flower, larger than the plant itself. 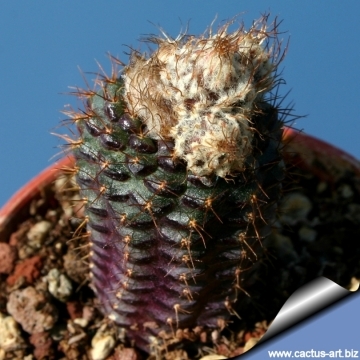 The diminutive stem is a splendid shining dark-purple, with ginger spines. Origin and Habitat: Argentina Northeast (Entre Ríos). Kakteen (H. Krainz) 50-51: CVIe fig. (1972). Frailea mammifera f. cristata hort. 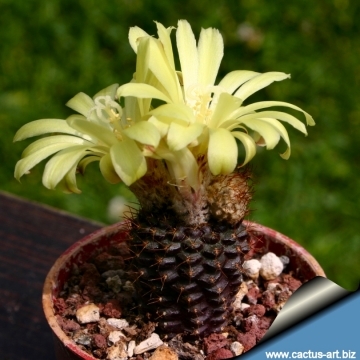 Description: Frailea angelesii is a miniature slow-growing species. It branches from the base, and eventually produces small clumps . Stem: It is diminutive in size, shortly columnar, shiny dark-purple or dark-brown, up to 3 cm in height (or more in cultivation), 2-2,5 cm in diameter. Ribs: About 13, with round and tapering tubercles, with a very dark purple-brown lunate, markings beneath the areoles. Areoles: Placed on the upper side of the tubercles. Spines: Ginger coloured, spreading, thin, 1,5-3 mm long. Roots: Fat central tap root. Flowers: Infundibuliform, larger than the plant itself, sulphur-yellow, 2,5 cm in diameter. But don't be disappointed when the easily produced buds fail to open. Fraileas are cleistogamous, meaning that their flowers are internally pollinated and produce seed without even opening. Without the need for pollination, the buds rarely reach full bloom and remain closed. They will open only in great heat, in the hottest, brightest, afternoon sun, if at all. Fruits: Dry, indehiscent, that detach easily, pericarp membranous, fragile that break easily, releasing the seed. Remarks: This plant is short-living (It only lives about 10-15 years). 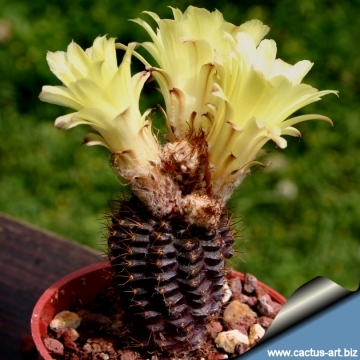 Cultivation and Propagation: Fraileas are are tiny plants with comparatively big yellow flowers, often bigger than the whole plant itself and are especially suitable for those with limited growing space. They can be easily grown in a sunny windowsill or a small greenhouse. 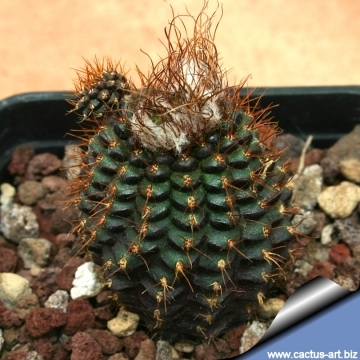 The secret for keeping Fraileas happy and growing is to pot them in a rich, porous soil with good drainage and aeration, to give them lots of water and let them dry out between waterings. 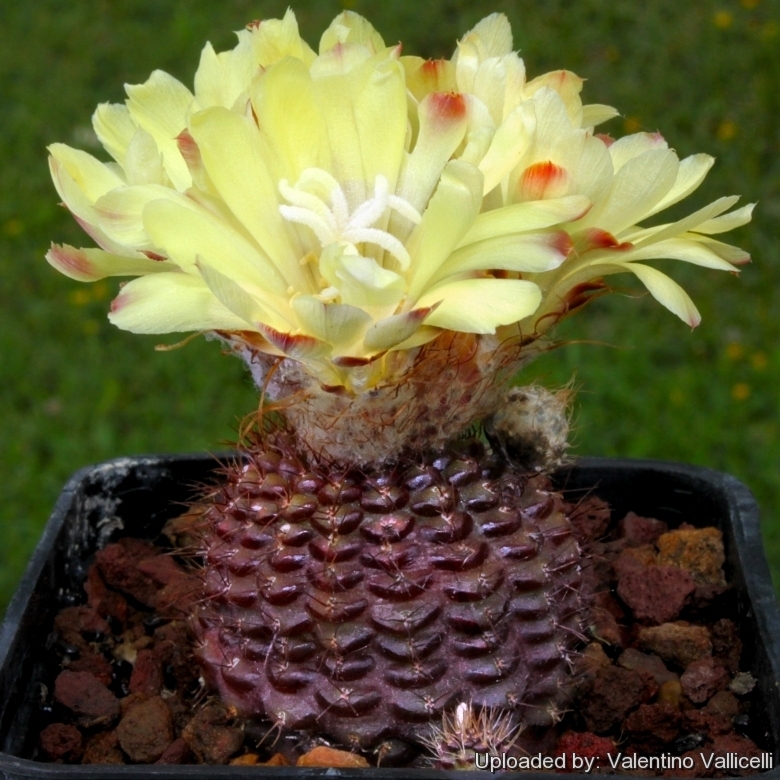 Fraileas do like more water than most other cacti. If you over-pot them (in about 6-7 cm pots) they grow much better and healthier, as they can be quite short-lived if not given correct growing conditions. During winter they like cool and dry places (minimum temperature of 5-10° C) but even light frosts do not harms them. 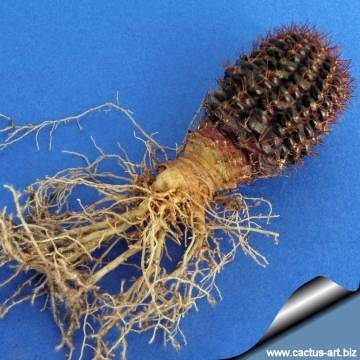 Characteristically, during the dry season plants retract completely under the ground, both in the wild and in cultivation too. Occasional light spray of water during the winter helps plants from shrivelling up too much. In the summer they like the pot to be filled with rainwater (which is always better to use than tap water) quickly absorbed by the plants, and one can almost see the little bodies swelling up. After a day or two, it is best to drain off any remaining water in the under-pots. Sun Exposure: They enjoy full sun. In a shaded position the plants grow faster, but are not flat shaped or dark coloured. Propagation: With fresh harvested seeds or (rarely) by grafting. The seeds germinates well. Sow the them on the soil surface, so that they can grow to a reasonable size before they have to be pricked out into a bigger tray. The seed trays go into a heated propagator on a windowsill where they catch the afternoon sun. It does not take long for the seeds to germinate, and some will do so within a day or two after sowing. When they have reached a height of about 1 cm they are pricked out into a larger tray, where they remain until they are large enough to go into individual pots.